This is not a complicated recipe. It only calls for five ingredients, and one of those ingredients is a pinch of salt. 🙂 If you’re feeling intimidated by the idea of making your own chocolate, don’t be! 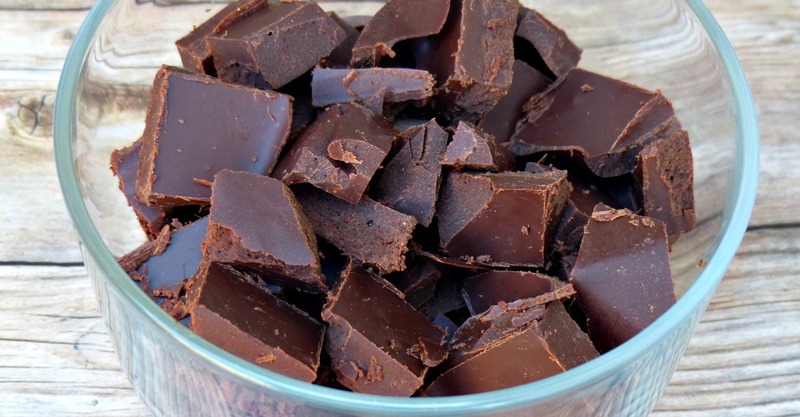 I don’t do complicated recipes, so I promise you that this homemade Paleo chocolate recipe is super simple. Cocoa/cacao butter may not be an ingredient that you normally keep in your pantry, but it’s really easy to find when you know where to look. Health food stores like Whole Foods will likely carry cacao butter, but I always buy my cacao butter online because it’s MUCH cheaper online. My current favorite is this cacao butter, but that’s mostly because it’s the best price I’ve seen. I’ve tried a number of other brands and they’ve all been delicious! To prevent your chocolate seizing, make sure that all the equipment and tools you use are completely dry. Exposing your chocolate to small amounts of water can cause it to seize. This makes a very dark chocolate. If you prefer your chocolate sweeter, you can add more honey to taste. I’m listing cocoa butter in this recipe, but I actually use cacao butter myself. Either can be used interchangeably here. If you are planning on baking with your chocolate, I suggest instead using my homemade chocolate chips recipe. It’s nearly identical to this one, but it contains a small amount of tapioca starch to keep the chocolate from melting in the oven. Add your cocoa powder, honey, vanilla, and salt. Use an immersion blender to thoroughly mix all ingredients. While you can do this by hand with a whisk, I highly recommend using an immersion blender, as it does a superior job of blending the honey in with the rest of the ingredients. Line an 8x8 glass baking dish with parchment paper. Pour the chocolate mixture into the dish. Cool chocolate in the fridge. Once hardened, chop chocolate into chunks. You can make them as big or as small as you want! Store chocolate in an airtight container at room temperature, or in the fridge or freezer for longer-term storage. My daughter is a Vegan, can I use agave instead of honey in this recipe for Homemade Paleo Chocolate? I haven't tried it, but I bet it would work!